A franchise seven movies in shouldn’t be this good. The “Fast and Furious” series almost died after the dismal “2 Fast 2 Furious,” but in 2006, director Justin Lin revived the franchise with the immensely enjoyable “Tokyo Drift.” Although Lin’s follow-up (2009’s “Fast & Furious”) was a misstep, he quickly bounced back with “Fast Five,” taking the franchise to another level. The scope, laughs and characters ballooned, proving less isn’t always more. “Furious 7,” directed by James Wan, continues the series’ tradition of going big. 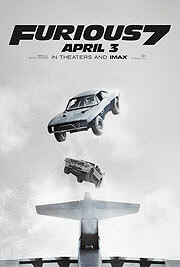 The sequel picks up not long after the events of “Fast & Furious 6.” Owen Shaw (Luke Evans) is still alive, but just barely, and his older brother, Deckard (Jason Statham), is going to finish the fight he started, vowing to take out Dominic Toretto (Vin Diesel), Brian O’Conner (Paul Walker), Letty (Michelle Rodriguez) and the rest of the gang, including series regulars Tyrese Gibson and Ludacris. That’s the core story of “Furious 7,” but there are terrorists, a hacker and a device that can track anyone in the world that the “Fast” family must contend with as well. These movies are almost overstuffed by design. Chris Morgan’s script doesn’t really have 127 minutes of story to tell, but “Furious 7” is so giddy and overblown that its bloated runtime is more of a blessing than a burden. Right when you think these movies are about to slow down, they keep going, especially in the action department. Do the action set pieces defy the laws of physics? Possibly, but that’s what makes them so appealing. When a car hops from building, to building, to building, it’s like something out of a 12-year-old’s dream. Almost every set piece is impressive, including a chase sequence in the mountains that’ll go down as one of the year’s finest pieces of action. There’s total clarity in where characters are amongst the chaos and wreckage, their mission is simple, and each character serves a purpose. There’s also not a weak link in the ensemble. Although Diesel is pretty one-note as Toretto, the character’s simplicity is a part of his charm. Toretto is a totally beefed up, B-movie cliché – a guy that just wants to protect his family. There’s a sincerity and tongue-in-cheek quality to the drama and stakes in “Furious 7,” and it’s a tough tonal balance the film pulls off. There’s also some new additions to the cast. Kurt Russell shows up as a mysterious government agent, and what could’ve been a purely expository character is, in the hands of Russell, a scene stealer. Few actors are as charming as the veteran actor, so it’s no surprise he makes a small role this much fun. Unfortunately, if there’s one supporting player who gets the short end of the stick, it’s Dwayne Johnson. Johnson’s Hobbs is a fan favorite, for good reason, but he’s only in the movie for roughly 15 minutes. Each moment with him is a joy, whether he’s sweating profusely or issuing threats, but his presence is missed in the second act. As for Paul Walker, the filmmakers give him a nice sendoff. Wan and all involved were stuck in a tough spot in how to handle saying goodbye to Walker and the character of Brian O’Conner, but they do so with respect and love. They used Walker’s brothers (Caleb and Cody) in addition to facial replacement technology to complete O’Conner’s remaining scenes, and the effect mostly works. There are shots where O’Conner’s face is obviously hidden from the camera, even when the character is speaking, but it’s only a minor distraction. After the tragedy this production faced, it’s astonishing how well “Furious 7” turned out. Wan, who’s best known for his horror films, proves he’s the real deal as a blockbuster filmmaker. And though he hasn’t reinvented the series’ formula, he’s managed to deliver the kind of big popcorn fun these movies promise.